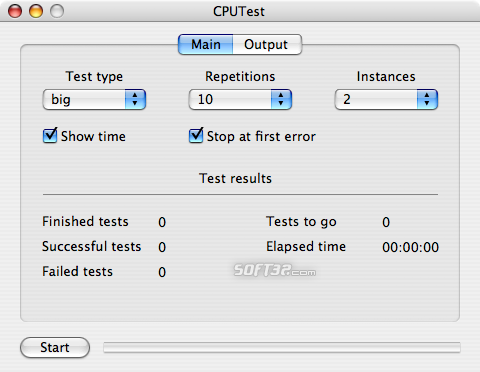 CPUTest is a GUI for the selftest command of Glucas. This command can be used to stress test a CPU and its cooling system. CPUTest may be used to verify stability when undervolting and overclocking CPUs. 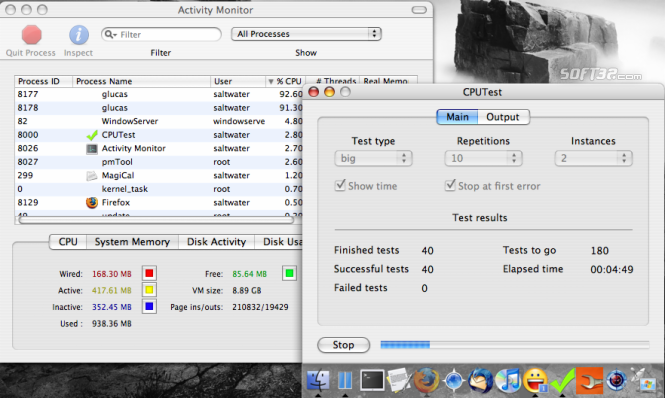 CPUTest is a simple application that applies a stress test to your CPU. In order to verify the stability of a CPU there were invented this kind of stress tests. This kind of test uses the CPU in full load, so if there's a cooling issue, or other hardware issue, the OS would mostly become unstable or crash, indicating you that something isn't right. Usually these stress tests use mathematic algorithms that requires high processing power. The algorithm that's behind this application tries to find Mersenne prime numbers. The iterations that are used in order to find these numbers use high CPU resources, so this kind of applications are used by the people who would need a CPU stress test that tests the system stability. CPUTest gives you the possibility to select the 'test type' from a drop-down list that includes items like: small, big, huge, enormous, primenet, or all. It also provides you the possibility to pick the number of repetitions and the number of instances. It also has other features like 'show time' or 'stop at first error'. 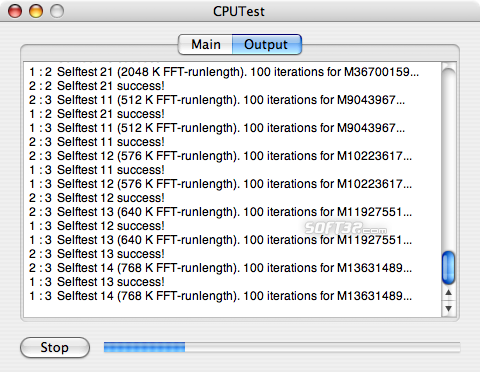 The number of instances is important because this depends on the number of cores/CPUs that you have on your Mac. For example: if you have a single core CPU, a single instance of the algorithm is enough, if you have a dual-core CPU, then you need to run two instances, or if you have a powerful Mac Pro with two dual-core Xeons installed, then you need 4 instances of this application. If you use less instances than the number of available cores/CPUs, then the stress test is not fully efficient. You can get fooled by the fact that it passed the test while there's a issue with your hardware. The 'stop at first error' functionality is great, even though it can be unchecked. If there's a reported error, then the application won't continue with its work. Sometimes when a machine has some hardware issues, it won't restart itself, but instead it can give all kind of weird and unexplained errors. If you run this stress test, and there's something wrong with your hardware, then you can find out by using this CPUTest. The 'output' section of this application shows the log of the running processes. It shows when a iteration starts and ends successfully. This is the place that you can check first in case your hardware fails the test. Pluses: it gives you an easy way to do a stress test to your system. Drawbacks / flaws: in some particular cases the stress tests might be dangerous to your hardware because nobody guarantees what can happen with your hardware. Use this for stress-test stability-check only. In conclusion: this is a useful tool if you want to do a stability check of your CPU. Even though this is a benchtest, usually a good benchtest won't hurt your hardware. A benchtest doesn't create new issues, it just tests if your hardware can resist to the maximum designed capacity. CPUTest is a GUI for the selftest command of Glucas. This command can be used to stress test a CPU and its cooling system. CPUTest may be used to verify stability when undervolting and overclocking CPUs. A universal binary executable of Glucas is included. Documentation is included in the download. LibreOffice 5.4.3 LibreOffice - the document foundation.